My couch to 13.1 journey, and beyond ! My new best friend, Echo. At the same time we were there, a gentleman brought in his GSD puppies for shots. Try being in a tiny room full of adorably clumsy german shepherd puppies crawling all over you, and resisting the urge to take one home with you. Game over. After some obedience training, I am looking forward to taking her on some great runs, and sharing some great times with my best girl. She has yet to grow into those humongous ears !! 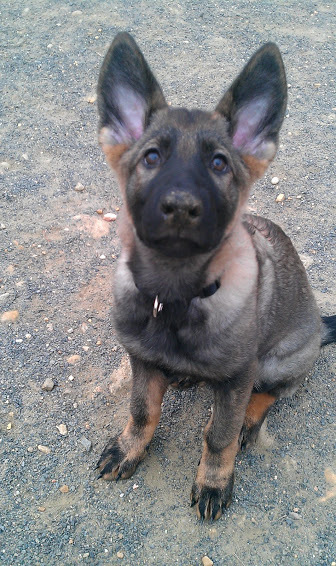 This entry was posted in Echo and tagged animals, best friend, big ears, cute, dogs, german shepherd, half-marathon, puppy, running, training on January 9, 2013 by frenchform. Running my first half-marathon !